The talk, which is free and open to the public, is from 7 to 9 p.m. in Vianney Hall Auditorium on the seminary campus, 100 East Wynnewood Road, Wynnewood. After five centuries of division between brothers and sisters consecrated to Christ in baptism, it has become clear that the pursuit of Christian unity requires not only frankness of theological discussion but a true and charitable desire to understand one another. George also serves as the general editor of the Reformation Commentary on Scripture, a 28-volume series of 16th-century exegetical comment. He serves on the editorial advisory boards of First Things, Christianity Today and Books & Culture. 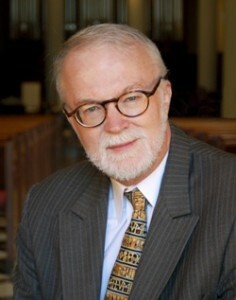 He is a life advisory trustee of Wheaton College. An ordained minister in the Southern Baptist Convention, he has served on the Faith and Order Commission of the World Council of Churches and has chaired the Doctrine and Christian Unity Commission of the Baptist World Alliance. Nicanor Austriaco, O.P. : “Evolution and Creation,” 7-9 p.m.
Bishop Robert Barron: “On the Church and Social Communications,” 7-9 p.m.
Bishop William Michael Mulvey: “Christians and Muslims: Love Creates a Dialogue Between Friends,” 7-9 p.m.
Dr. Mary Hirschfeld: T.B.A., 7-9 p.m.